Pregnancy is normally considered to be full term at 40 weeks. These weeks are then split into Trimesters. The last trimester is considered to be from 28 weeks to term. We have now hit the third and final trimester. The strangest thing is, that every week, I think I have my head around that pretty soon, our lives will never be the same and then we move onto the next week and all those doubts and fears return. As I have said in a previous post is that I always worry about money. In our house Christine deals with all the money. Not only is she probably better at organising our finances that I would be but I think if I dealt with it, I would become obsessed, stay up at night worrying we going to have to eat cardboard for a week, just so we can buy a pack of nappies. Luckily, we won’t! So as we hit the home stretch, we are going to perform a little experiment. We are going to try and live on the little money we will have once the baby arrives. Christine has worked out how much we will both get paid from my wage and SMP and that is what we shall live on…..I’m not nervous honest! If you don’t hear from me for a week, we did start eating cardboard and it didn’t go well! 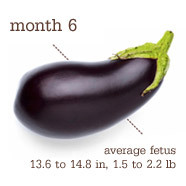 According to the ‘How big is you baby’ ticker from www.thebump.com we are STILL the size of an aubergine/eggplant. It also says that the baby’s lungs are mature enough that, if born right now, she has a pretty good chance of surviving (with help from medical technology). Her skin is still pretty wrinkly (one byproduct of living in amniotic fluid) but will smoothen as fat continues to deposit. The only real development recently is that little bump is getting very active. The wife is convinced it’s an Octopus (Not sure what that says about me! ), the little thing is having a good ‘ol kick at every part of her insides. I can’t see anywhere that says you can have too much movement, so we are taking it as a positive. Love the weekly updates, money is always a big concern but somehow you manage to live to your means. My wife is still off on maternity leave and it has been really hard but we are surviving and its not forever. If it doesn’t work out then I can recommend some of the tastier cardboard options that are out there. You could start with the nappy box?! It’s been a while since we were at your stage…OK, by a while I mean 10 years. But we’re still here. One way or another, you’ll find a way to adapt to the expenses. Remember, you’re about to lose your entire social life…OK, that wasn’t so comforting, but you’ll save a bundle by not eating out, beers, movies etc. That can be significant! Exciting times… and money isn’t everything. I’ve lived on a (very) modest writing income since giving up a ‘normal’ job three years ago to look after Charlie. But I’m so much richer than I’ve ever been before.